A Nook and a Behemoth! Happy second week of holiday vacation to all you reader guys! Hope you had a good Christmas. I certainly did, spending time with family and friends, but I also got one of the coolest gifts I've ever received--a brand new NOOK!!! 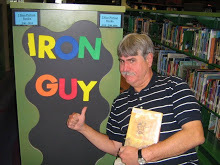 Yes, indeed, the Iron Guy meets 21st-century technology! These Nooks and Kindles and other e-readers could be the wave of the future. A lot of grownups are even wondering if they will replace regular books someday. (I don't think so--I bet there will be a mix of e-books and regular books in the future) What do you guys think? 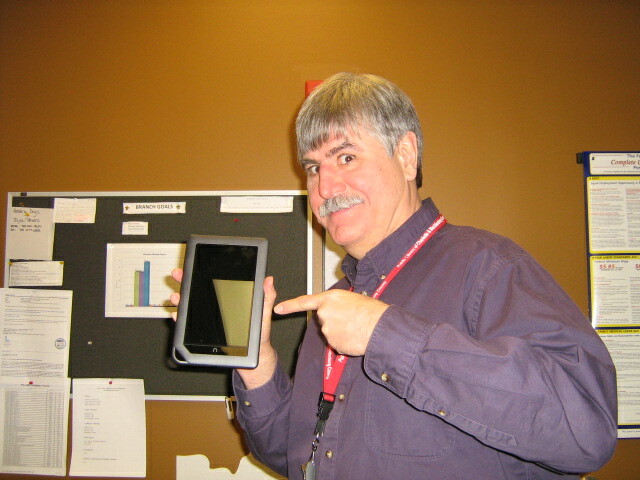 And do any of you have a Nook? 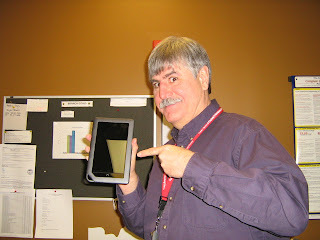 A Kindle? Any type of e-reader? Do you like it? Or not? Write in and tell us. And now for a review of a truly rockin' book--Behemoth by the amazing Scott Westerfeld. I was a huge fan of Leviathan, the first book in this trilogy, and I would have been happy if this second one had been just as good. Well, guess what--this one's even better!! The story takes place in Istanbul (or Constantinople), Turkey in 1914. World War I has just broken out--except, in this story, the world is a little different from the real world of WWI. This is an "alternate history" story; the Germans and Austrians (called "Clankers") use walking war machines, while the British and their allies (called "Darwinists") use fabricated animals. The two main characters, Prince Alek of Austria and Dylan Sharp (who's really Deryn--I'll get to that in a minute) have flown to Istanbul. Prince Alek is a prisoner of the British. Dylan is with Dr. Barlow, the granddaughter of Charles Darwin, who is on a mission to deliver a secret cargo to the Sultan. Things do not go as planned, however. The mission fails spectacularly, Prince Alek escapes, hides in Istanbul and joins a revolutionary movement to overthrow the Sultan. In the meantime, Dylan performs acts of heroism, gets sent on an underwater mission and discovers a deadly Clanker weapon. And speaking of secrets, important people start to discover Dylan's secret--which is that Dylan is really Deryn, a girl who disguised herself as a boy to join the Royal Air Service! If you liked all the adventure, excitement, humor of Leviathan, then get ready, because this book has all that plus some!! You've got Clanker machines attacked on the streets of Istanbul, strange Darwinist animals, daring nighttime escapes and an unbelievable battle at the end. And the illustrations!!! In most books, the pictures are just--well, they're just sort of there and don't really add anything. In Behemoth, the illustrations really take you into the story and bring everything vividly to life. I enjoyed this one and I'm sure you will, too. I can't wait until next year when Goliath, the third book, comes out!! PS--if you want to see my review of Leviathan, click here. If you haven't read it already, you could go right to Behemoth, but I'd advise you to read Leviathan first so you get a better sense of what's going on. Season's Greeting From the Iron Guy! What better way to usher in the holiday weekend than with a little rock and roll? Yeah, baby, that's the way to rock the night away! Well, the holiday is right around the corner.The library will be closed for three days and I plan to kick back, relax, and spend time with family and friends. I might even get some reading time and I'd love to tell you all about it. I'm only pages away from finishing Behemoth and, MAN, is it good!!! Better than the first one and that's saying a lot. I certainly wish every one of you all the love, joy and peace of the season. Hey, reading fans, school's going to be out for holiday the break soon, maybe even today for some of you! Hope you all have a lot of fun. Speaking of fun, there will be a lot of movies coming out over the holidays and there's one already out that guy readers would especially want to see. I'm talking, of course, about The Voyage of the Dawn Treader by the incredible C.S. Lewis. We have a lot of Narnia fans out there and for good reason--these books are great reads!! They're chock-full of adventure and magic and they keep you flipping pages until the very end. 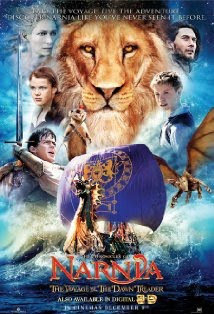 Well, The Voyage of the Dawn Treader is my favorite of all the Narnia books. I'll never forget the first time I read it--it was summer and I was able to stay up late reading. So I got this out one night, intending to read a few pages--and stayed up until 3:00 am! And rarely have I been as entranced with a book as I was that night, staying up late and sailing with Caspian and Eustace and the Pevensie kids and Reepicheep to the very end of the world. So let me ask--have any of you read it? Did you like it as much as I did? (and don't stay up so late unless you have permission form your parents!) Do you plan to see the movie? Have you already seen it? Did you like it? Write in and let us know! PS--click here to see my review of the Dawn Treader audiobook! That's right, buckaroos, I'm the Kandy Kane Kid and I come around this time every year to blast any Grinches with two barrels of holiday cheer. I also like to tell you about some mighty good reads too. Here's a MIGHTY good one I like to tell you about every year. It's Kringle by the talented Tony Abbott. It's got everything guys love--action, adventure, and a big, destructive machine! Kringle is named after the sound a bell makes when he's born. He's living with his guardian in Britain in the fifth-century A.D. The Roman armies have left, though, and that means order is breaking down That means the bad guys are taking over. And that means the goblins--and these aren't your cutesy fairy-tale goblins, either. They're the real thing--vicious, quick, and able to do serious damage to anyone who messes with them. After they capture his guardian, he goes out to rescue her but stumbles onto the goblins' true plan--and his destiny to become gift-giver to the world. "Wait a minute," you might say, "We've been hornswoggled! You mean this book's about Santa Claus??!!" Well, yeah, but his isn't some Hallmark holiday story. This book's got danger, fights, escapes, magic--as I said, everything a guy could ask for in a book! So don't let this holiday season go by without reading Kringle!! Got that? Then go get it! !